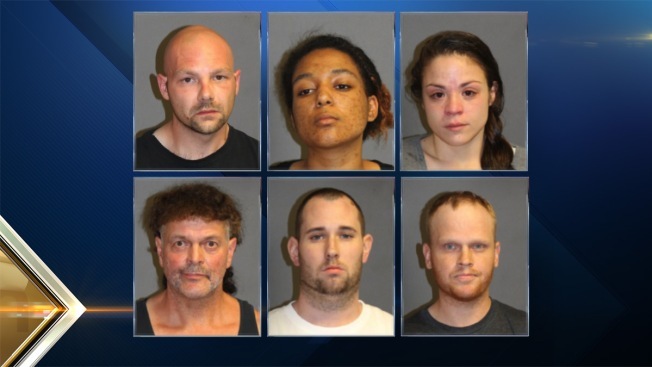 Police in Nashua, New Hampshire, have arrested six people for various drug crimes. Brian Kelley, 32, of Mulberry St. is charged with acts of prohibited sale of a controlled drug, Fentanyl. He's being held on $10,000 cash bail pending his arraignment. Olivia J. Pinion-Felton, 20, with no fixed addresses, is charged with acts of prohibited sale of a controlled drug, heroin. This is her second offense. She's being held on $25,000 cash bail pending her arraignment. Cassondra H. Davis, 27, of Blossom St. is charged with three counts of acts of prohibited sale of a controlled drug, heroin. She's being held on $20,000 cash bail pending her arraignment. David L. Rugar, 55, of Broad St. is charged with possession of a controlled drug, second offense, Suboxone. He's also charged with possession of a controlled drug, second offense, Oxycodone Hydrochloride. He is being held on $10,000 cash or surety bail pending his arraignment. Travis M. Deluca, 26, of Lock St. is charged with acts of prohibited sale of a controlled drug, second offense, Fentanyl. He's being held on $50,000 cash bail pending his arraignment. Kelley, Pinion-Felton, Davis, Rugar and Deluca were all taken into custody on May 19. On May 17, Karl M. Saunders, 33, of Yarmouth Dr. was arrested on a bench warrant for non-payment and possession of a controlled drug, Fentanyl. He was released on $250 cash bail ahead of his arraignment. This was a joint effort by the Nashua Police Department's Narcotics Intelligence Division, Problem Oriented Policing Unit and Traffic Unit.